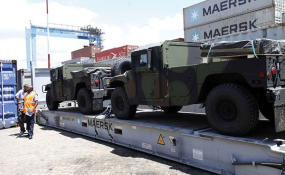 Military vehicles spotted at the port of Mombasa on April 11, 2019. Even as the region modernises its militaries, there has been a noted drop in the overall spending, attributable to South Sudan's cutback of more than 50 per cent in 2017. Kenya remained the region's top military spender, splashing out $963.5 million in 2017, followed by Tanzania at $593.1 million, then Uganda at $444.6 million and Rwanda at $111 million.